This past Friday Jan 21 we raised a customers boat that sunk on Lake Hamilton. Icy water conditions, extremely low visibility all hampered the raising of this boat that just didn’t want to roll over and play nice. After several lift bags, ropes, and rigging in just the right places, this 28 ft SeaRay finally rolled upright in the water. A 3 inch pump and about an hour later we were ready to tow it to the mechanic to bring it out of the water to start to dry it out and warm it up. Each year we raise up to a dozen boats that sink to the bottom of the area lakes, and all for various reasons. Frozen intakes, lack of service to the bellows around the outdrives, or just simply dead batteries. 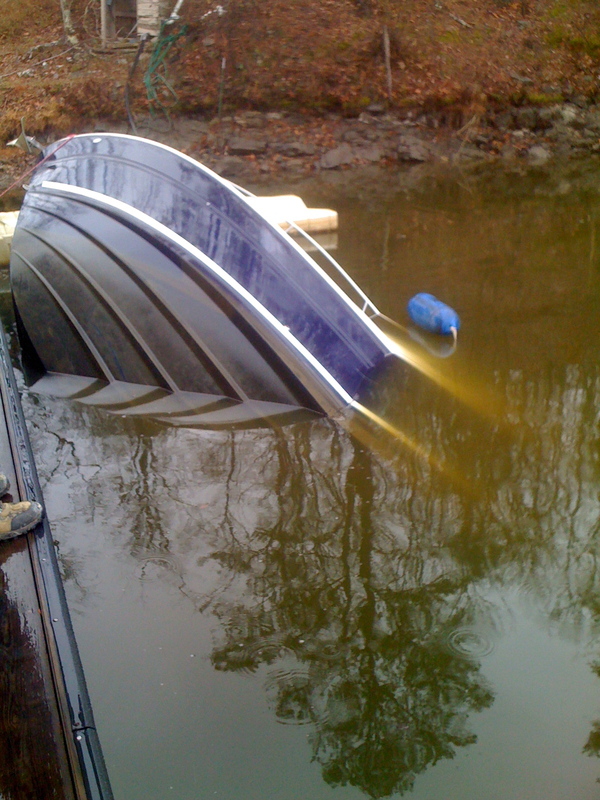 Several good and helpful tips on what to do to winterize your boat can be found at BoatUS.com It is also recommended to contact your local marine mechanic for his recommended steps needed to keep your boat off the bottom of the lake. If you have questions about a recovery of something, or just want to hear more about this particular recovery, come by the store or drop us a line. We are always interested in swapping stories, especially good ones!